Designing is in my genes. My father, an architect, set me on my path in junior high school by commissioning signage for a conference that he was part of. Over the years, I have thought I should do other things but the beauty and mystery of glass always brings me back to the studio. My studio does a fair amount of historical work, whether it is new work sympathetic to design styles of a particular point in time or rejuvenation of older windows from homes and churches. It is important that the artistry of the past survives into the future to inspire future artisans and craftsmen. Initially, I used an architectural software program to design our windows, as it provided accuracy and the ability to copy sections of designs to maintain a cohesive look in a building. As time went by it became important to illustrate to clients the actual final look of the windows once designed. Glass Eye 2000 is invaluable for that purpose; using the photos of actual glass to be placed into the "lead" matrix of the design. After years of using colored pencils and markers to provide color to a design, it is nice to be able to change the color quickly with the program and even provide alternative renderings. These can be sent by email in JPEG format. This saves time when dealing with churches that are hundreds of miles away. I often meet with committee members at my computer so that they can see the effect of changing one color in a design. They can then go home with a printout of the adjusted design. The design you see here was used in a closet to provide light and style to a home that also had a large entryway and stairwell similarly bestowed with stained glass. We were asked to create something in the European Arts and Crafts style that would let in light, but also be private enough for an executive's private residence. The client's designer liked the work of Rennie Mackintosh, so we started there; more precisely, we started studying the Glasgow Tea Room. We didn't want to use the overworked "rose" design, but liked the long flowing lines. We also liked the exaggerated use of squares and geometry. This would work well with standard bevels, keeping the cost modest, but the appeal high. Mackintosh used a restrained color palette, ideal in our situation, which required a very limited use of color. To create some interest and unique qualities to the window, we used a European Opak glass that consisted of a light amber glass with a flash of white on the back. We used both sides in the design, turning front and back for interest during the evening hours when the "opal" glass would stand out from the clear textured background, some areas looking light gold and other areas white. Glass Eye 2000 can be used for designing with the standard bevels. Our studio also does custom beveling, so we could modify some of the bevels to create a truly custom look. There were parts of the design that would have been difficult without the plotting and cutting of the patterns available in the Enterprise Edition of the software. The leadwork is an important element in the window. 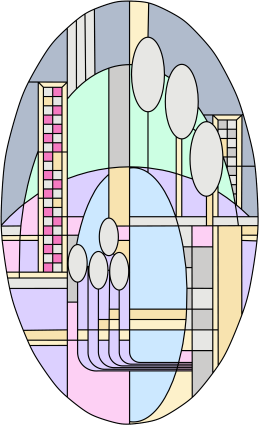 The "paths" combining into one solid element was borrowed from Mackintosh's designs. There is no glass used in spaces between the lead channels running parallel to each other at the bottom, but rather the design relies on tinning the lead during the soldering process. The structure is strong due to the interlocking glass shapes and their positions in the design. Artists should remain true to their time periods, but also try for a timeless sense of style. It is essential to remember that it is not just your client that you design for but yourself and future generations. A church building may still be standing three hundred years from now, so it is important to do your best work and to use the best materials in any endeavor. This is especially true of the design work. In the studio, we use a lot of clear textured glasses in contemporary work. This is a matter of working with reflections, highlights and negative spaces. We often use different colors from the palette to indicate different glasses rather than the glass photos provided in the program. In this manner, we can select glasses "on the fly." Allowing for inspiration and past experience during glass selection creates a unique artistic statement. In this manner, a person can see the underlying patterns in the design. Good design is critical to my reputation and Glass Eye 2000 helps in all aspects of the process. Some additional examples of our work appear below. One of the main focuses of the studio is residential doorways. 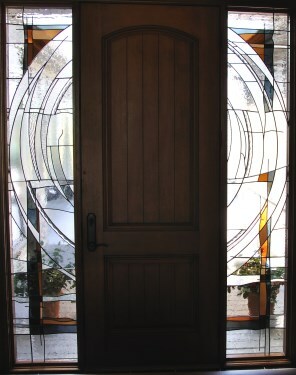 This particular doorway utilized cast glass pieces and painting to create impact. 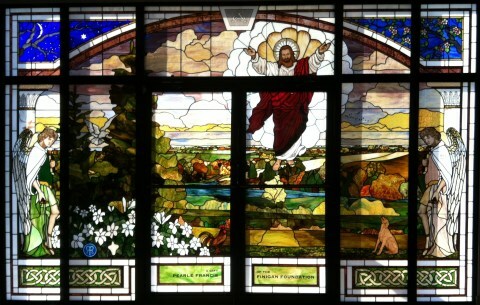 The large Ascending Christ window is part of a set installed in a Catholic cemetery. This illustrates the need for symbolic understanding of elements in the design. Several days were spent researching the elements used, such as the descending dove, dog, rooster, angels (there are four total in the set), etc. The window comprises eleven panels in store front aluminum sashes of various sizes protected from the elements by insulated units. The background of the window is a depiction of a valley north of the cemetery, with the steeple of the nun's retreat hidden in the trees. All of this was only possible using the various parts of Glass Eye 2000 including the trace function, color function, plotting functions, and of course, the editing capabilities. Harry Tompkin lives and works in Lincoln, Nebraska. A sometime fisherman and "dad" to three active dogs, Harry enjoys the outdoors with his wife, Lisa, who is equally creative. A degree in English Literature for the University of Nebraska has helped Harry interpret and utilize meanings and symbols in his work for clients and churches. The emergence of the contemporary German glass designers in the Seventies and Eighties fueled his interest in the use of American and European antique glasses. The American glass artists La Farge, Tiffany, Frank Lloyd Wright and many of the artists from the Studio Glass Movement in the same time period have inspired him to design windows that are beautiful, unique and structurally sound. 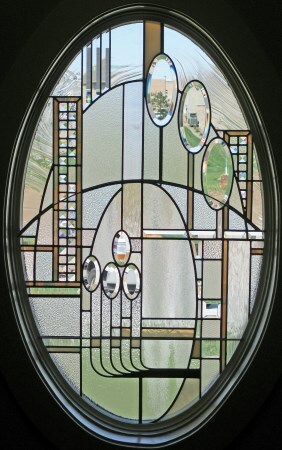 The glass is the key, whether it is beveled, etched, painted, fused or shaped. It is the main element in any design. He values most his repeat customers, who continue to bring him new challenges. Working solely as a glass artist since 1981, Harry continues to design, build and rejuvenate stained glass through his company, The Palace Glass Company. His current focus is a public art project that will utilize thousands of pieces of preformed glass rods fused as "brushstrokes" in a kiln formed light sculpture influenced by Van Gogh. Please visit his website and his Facebook page.